Yesterday we noticed that a new collection was added to the digital collector app Quidd which included 3D-figures in the Cutie Mark Crew Style. Along them in the newest set was Queen Chrysalis, a character we never seen before in the Cutie Mark Crew line. Set of the first and second wave of Cutie Mark Crew figures are being found all over the place, but we've got a scoop of who might be featured in one of the upcoming sets! 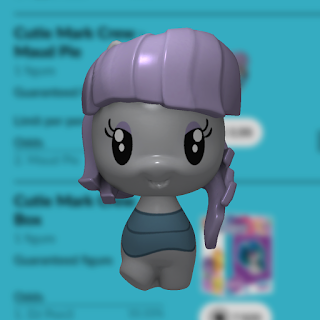 In the digital good collecting app Quidd, which we wrote about before, several sets of collectible 3D characters are available, including a line of Cutie Mark Crew figures. Just today a new set was announced, featuring Princess Celestia, Princess Cadance and... Queen Chrysalis! That's right, before she's even announced as a Cutie Mark Crew figure the 3D design of her is already presented in the Quidd app to collect. And as these assets are provided and licensed by Hasbro, it's likely that Queen Chrysalis is in the works as an actual figure in one of the upcoming Cutie Mark Crew blind packs or multi packs. If you want to take a close look at the Queen Chrysalis figure in digital form you can check her now in the Quidd app on iOS and Android. Cruising Cutie Mark Crusaders Set Appears on Amazon UK - Return of GOH? Amazon UK has listed quite an unexpected and exciting new set! The Cruising Cutie Mark Crusaders set to be exact and it contains the Cutie Mark Crusaders with molded manes and articulation. 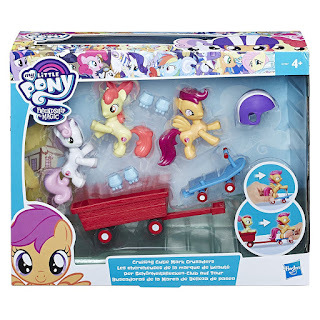 Scootaloo comes with her own scooter as well! But there are also some other accessories like a cart which can be attached to the scooter, and some in-line skates. 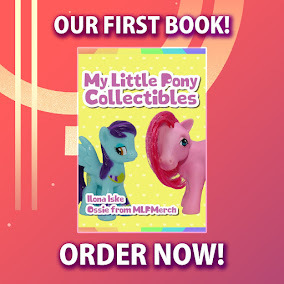 Also, notice that Apple Bloom got the wrong eye-color on the loose product image photo's. However it's fixed with the in-packaging image so it's most likely a Prototype that was photographed. The official Polish Equestria Girls Instagram account just posted this image on their feed. We all know that the normal Equestria Girls dolls got a whole new look so what about the Minis? 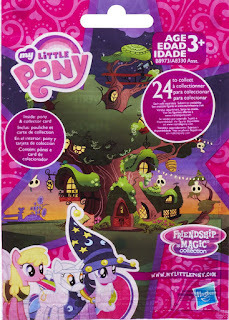 Well this image clearly shows a new kind of Equestria Girls Minis. First of all the whole look is way more Chibi-like with less detail int he eyes. Second, some articulation has also been removed like with the knees and arms. Third: the clothes are also way less detailed. A new and quite strange listing has appeared on Amazon. 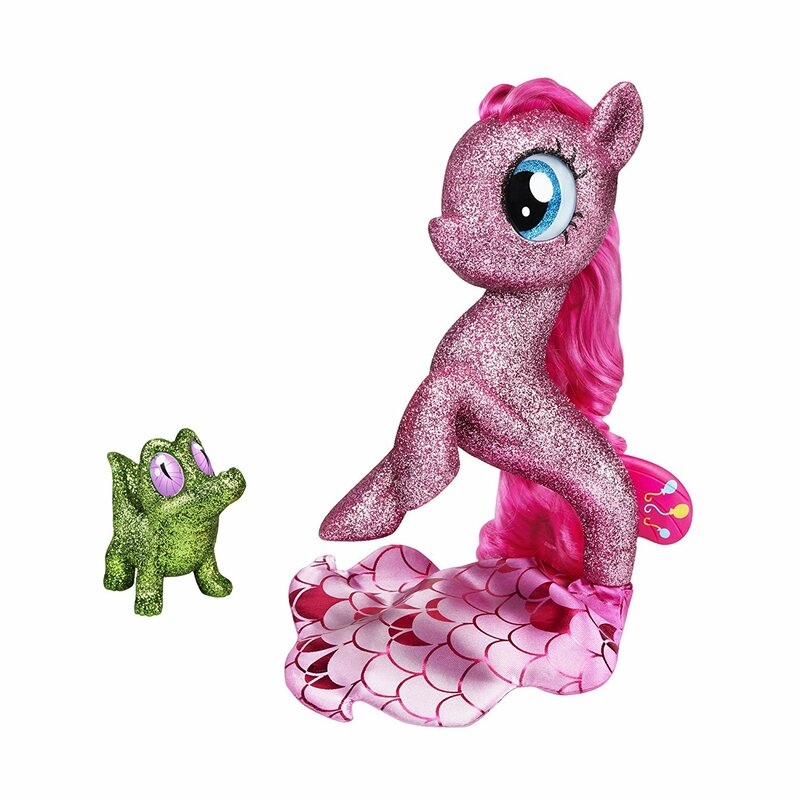 It's a Pinkie Pie Seapony the size of the Fashion Style ones but this one is completely covered in Glitter! She also features a nice fabric tail-fin. And what's Pinkie Pie without beloved pet Alligator Gummy? Who is also covered in Glitter. But perhaps the most interesting thing is the packaging. At the bottom there's a button which presumably lights up the base. We saw the same effect before with the DJ Pon-3 SDCC 2013 Exclusive. That makes us wonder... is this one also an convention exclusive? Or is she perhaps a collectors item that is eventually also released in stores? (Like some of the Collectors Monster High Dolls) We hope we can solve this mystery soon! A product sheet that has popped-up online is showing a list of upcoming sets and characters in the 2017 MLP The Movie Guardians of Harmony line-up, some of which we've not heard of before. The initial waves consist of sets we've seen at the New York and Brazilian Toy Fairs, earlier this year, but a few characters and releases are brand new information. For now the information includes character names, outfits, accessories and store exclusive releases. Thanks to Chevistian for the heads-up! Note: At this moment we were unable to confirm the source of this information. ATTENTION: This post contains spoilers about the upcoming MLP Movie this October. Do not read if you don't want to know anything about the movie. Here are some images for possible future Equestria Girls Minis Sets as these images are from a Planogram. The images are unclear but at least we can make out some theme's. 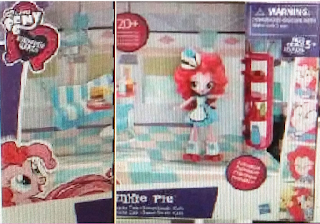 The Pinkie Pie one looks like it's themed after a Diner and the Fluttershy one has something to do with every one's pets as we can see those as well. No much other info is known aside from these images, but I bet we can expect more info at the Toy Fair where they perhaps will be displayed as well. Wave 17 Blind Bags on Amazon - Wave 16 Cancelled? The Amazon listing we wrote about a week ago has been updated, and now mentions that the figures are in fact wave 17. While it's good news that Wave 17 blind bags are already available in the US, we also have some bad news. We had direct contact with the Amazon seller, and we heard that all orders of Wave 16 orders are cancelled in the US. While we cannot be 100% sure if this has impact on the complete US, but hearing this after the big delay that we have seen so far only confirms the story that Hasbro is not shipping any Wave 16 blind bags into the US. This might result in another "International Exclusive" set like wave 2, because various other countries have had this set for months. For now this is all the news that we have on Wave 16. If the set does actually end up in stores we'll write a new post on it once we get the news in!